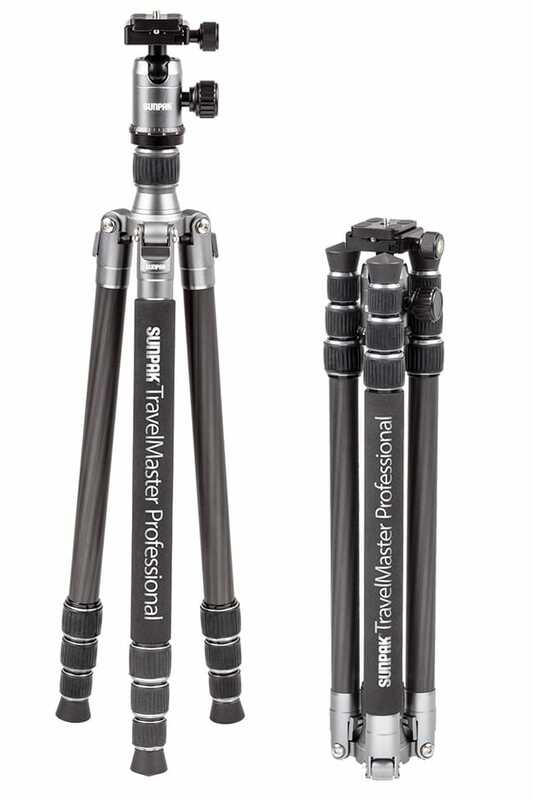 The TravelMaster Professional is a reverse-folding tri-monopod that has carbon fiber tripod leg sections and a center column that becomes a full size monopod in seconds. The TravelMaster Professional uses CNC machined components and extends to 63”, and folds down to 9.4” with the optional short center column. CNC (Computer Numerical Control) is a process that produces ultra-precision components, parts and products with precise dimensional control through powerful industrial computer systems and software programs. Unlike cast components and products which are subject to casing errors and flaws in its materials which could lead to failure or less rigid components, CNC components start with solid blocks of high quality aluminum which is then machined on all surfaces creating the ultimate pinnacle and quality, durability and precision equal to your capture device. Accented with silver highlights on the head, chassis and leg locks to give it a unique look, the TravelMaster Professional weighs only 2.94lbs and supports up to 34.8 lbs. 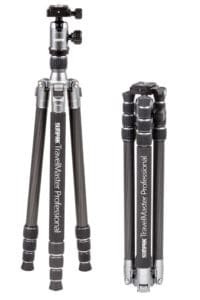 With its 4 carbon fiber leg sections and twist lock leg locks, the TravelMaster Professional can set up quickly and easily. The non-marring rubber tipped feet allow for steady and secure placement. The leg angle adjustment latches let you set up the tripod at various angles – even low angle – or reverse fold.